Though 2016 has been marked by upheaval and change, dance music has remained relatively stable. Much like other recent years, a certain kind of nostalgia has continued to fuel dance floors in the form of disco-fueled house anthems and purist techno bangers. There’s no shortage of quality— that’s for sure. But we noticed that certain tracks stood out among the pack to form a kind of recurring soundtrack to the past year. In our opinion, they might have recurred too much. You can interpret this as our “best tracks of the year” list, but we prefer to think of it as a roster of excellent cuts that we don’t want to hear out again for a very long time. This is the most underground we allowed ourselves to go while still being able to prove that it really was rinsed—at least on its own terms. So while Dixon didn’t play “Rushing Into Water” to thousands of people at once, it did get quite a lot of play in more heads-y circles. We heard it out at DIY bars and in mixes by the likes of Call Super, Phuong-Dan and even James Blake. And since both the label and the artist represent Düsseldorf and are affiliated with the city’s most famous club, Salon Des Amateurs, it’s no surprise that the bar’s flag-bearer, Lena Willikens, has given it love—and on our very own EB.Radio, nonetheless. U.K. styles exist almost in their own isolated universe. So while anyone with a passing interest in dubstep, garage or their permutations probably heard tracks like Orson’s “Fabrik” or Bruce’s “I’m Alright Mate” quite a lot this year, they’ve only earned an honorary mention in our year-end list. 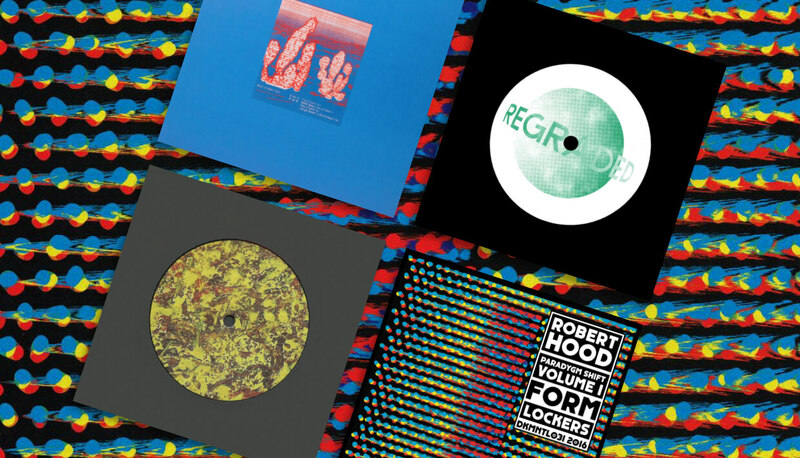 Of all the U.K. authors who put out what we consider big releases this year—Kowton, Asusu, A Made Up Sound—Hodge and Randomer made for a winning combination in terms of combined hype. The former broke out last year with several relatively huge records, while Randomer earned a long-overdue moment in the sun in 2016. Their collaborative record enjoyed playtime on multiple episodes of Ben UFO’s Rinse FM show, Mary Anne Hobbs’ and B.Traits’ BBC Radio programs, Scuba’s SCB Radio broadcast and beyond—but, of course, it was mostly played by British producers. It’s fitting that an especially big year as a DJ for Detroit native and NYC resident Mike Servito would coincide with a hit foray into producing. Servito had a lot to live up to with his first published piece of music because he’s well-known as a selector thanks to years of honing his craft and a few big, recent gigs with his close friend The Black Madonna—and his rework of Justin Cudmore’s “Crystal” didn’t disappoint. In fact, one could safely argue that the wiggly, loose-limbed and playful acid jam stole the show from Cudmore’s original. It received extensive play from big and small DJs alike, from unknown amateurs we heard in local clubs to rising stars like Avalon Emerson, Moxie to underground heroes like ItaloJohnson and Martyn and well-established names like Ben Sims, Prosumer, Kerri Chandler and more. We could’ve told you in January that the Zenker Brothers were bound to release at least one of the year’s most rinsed records on their Ilian Tape outpost. We thought it had already dropped in the beginning of February with the release of Skee Mask’s much-lauded Shred LP…but then a few months later came Stenny’s Consume IV. Compared to Skee Mask’s predilection for broken rhythms, Consume contained especially DJ- and floor-friendly bangers that appealed to underground champions like Kowton and the Hessle Audio guys as well as big-room operators like Dubfire and Phil Kieran. The most rinsed was “Consumer’s Tool”, an aptly titled jacking tumbler with electric highs and drums reminiscent of Shed, who played it on Boiler Room. If it’s included in recorded mixes by virtually every DJ who can’t resist a full-throttle, flawless textbook techno jacker—like Apeiron Crew, Stranger, Dustin Zahn, Rebekah, Tommy Four Seven and Ben Klock (in his Essential Mix, no less! )—it’s rinsed, mate. 2016 was the 20-year anniversary of Robert Hood’s Floorplan alias (and even longer in the trenches under his own name), and the year treated the Detroit stalwart very well. Floorplan’s new album was Victorious by name and by nature, being received well in all quarters, and with tracks like “Music” striking a chord with fans of big-room techno. Teaming up with Dutch festival entrepreneurs Dekmantel served him equally as well this year, as the first instalment of the Paradygm Shift EPs produced “Lockers”, which gave a nodded to his own history of minimalism and was heavily rinsed by Ryan Elliott, the Zenker Brothers, Ben Sims, DJ Hell and hometown pal Kevin Saunderson. You can safely bet money on one huge track like “Final Credits” breaking through each year. The criteria is pretty clear: disco influenced; warmly analog; samples preferred; dusty, shuffling grooves are mandatory. Previous victors in these maximum rinsage stakes include Motor City Drum Ensemble, Andrés, Art Alfie and Session Victim, and Midland joins that hall of fame this year with the breakout hit that he shrewdly held on to for his own disco house label, Regraded. After laying 50 Weapons to rest in 2015 (R.I.P.—or, if you’re Henning Baer, rejoice), these last 12 months in the world of Modeselektor have been wholly dominated by III, the new live album from their joint project with Apparat. The album’s key single, “Running”, was remixed by 50 Weapons/Monkeytown alumnus Shed, who’s still got what it takes to turn in a warehouse-style banger. While the white label 12-inch version of this record is doing modest business in Discogs terms, it was the highest-charted and played of all the remixes, which included offerings by Âme and Tale of Us. John Digweed rinsed it on Proton Radio, Scuba and Boddika during back-to-back sessions, big techno names like Marco Bailey at big room spaces like, um, Space, and Shed in his own live sets. We did notice that this is the only record helmed by a woman on this list, and we think that speaks to the existence of a glass ceiling in dance music. Tunes like Willow’s standout debut on Workshop or Beatrice Dillon’s brilliant outings on Alien Jams, PAN and Boomkat Editions were rinsed only to heads, and bigger DJs like Lena Willikens, Paula Temple, The Black Madonna and Helena Hauff released at most one track each this past year. That said, we’re positive that Avalon Emerson’s hit outing on the Whities label was rinsed to death on a broad level, as we heard both sides throughout the year in big clubs like Berghain and De School as well as at small bars staffed by anonymous DJs. To us, this was the most rinsed record of the year. But in the wider world, it’s still relatively underground. Innervisions boss and Resident Advisor’s reigning king of DJs Dixon has played the original version of “Energy Flow” regularly since it came out last year, and the release of DJ Koze’s double-remix package renewed the track’s lifespan. The “Miles & More” mix appeared on John Talabot’s Permanent Vacation label with an official music video that complemented its pop-savvy construction, but DJs like George FitzGerald, Talabot, Âme and Le Tough himself have favored the toolier “Splasher” mix. And it’s not hard to tell why: it’s the darker, moodier and more austere version. That combination is a sure bet in an era when emotion correlates to depth, which in turn distinguishes it from crasser mainstream festival fare. The absolute omnipotence of Giegling and its constellation of sublabels—and particularly anything related to Traumprinz a.k.a. Prince Of Denmark a.k.a. DJ Metatron—shows no sign of abating anytime soon. In fact, with the December release of POD’s new $100, 23-track, eight-LP box set album, 8, the mania will likely get even more rabid in the new year. Looking back, the most unavoidable track of the year was his nostalgic, Balearic refix of “2 Bad”. The emotional tones of this remix continued to endeare themselves across the board, from prog-house deity Sasha to Sven Weisseman’s set on Rinse FM and to loop house technician Radio Slave. However, the hype about his recent record Traumprinz 06 indicates that “2 Bad” may soon be swept off the Throne Of Rinsedness—yet the Prince Of Denmark won’t be overturned.